At the corner of 4 O’clock Road and Primrose Path are three pair of 2-story buildings called Winterpoint Townhomes. They’re only a block downhill from the Snowflake Lift, on the free bus route, and a couple blocks from the Riverwalk Center, the performing arts venue in the center of Breckenridge. Built around 1980, they are a split-level design with an open floorplan. All of the Winterpoint townhomes for sale have a balcony on the second floor, a small patio that opens on ground level onto a small common yard, and a garage. 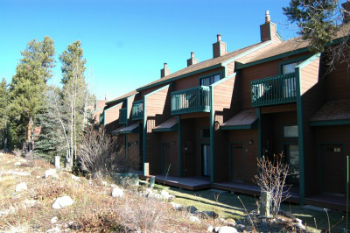 Below you will find current Winterpoint townhouse listings, or you can read more about this Breckenridge community. A recent exterior remodel of all buildings included stone lower level accents and 12-panel wooden garage doors. This update brought the Winterpoint townhomes into a contemporary look, and doesn’t take anything away from their design - to be an efficient ski home rather than one unit in a mass of ski condos. Winterpoint is close to ski-in – is just across the road from 4 O’clock Run, which is a gentle ski run from Peak 8 and 9 to the condos on 4 O’clock road. The Snowflake Lift is a short one-block walk from these homes and the free town bus system runs in front of them. The bus makes stops at the other ski lift base areas, the major grocery stores, the gondola and Main Street. In the summer, 4 O’clock Run is a walking path that connects to the national forest and trails on the ski mountain. Size: 1257 sq. ft. to 1616 sq. ft. Amenities: garages, near the snowflake lift, in town, on the bus route, near 4 O’clock road and run, common area, member of the Upper Village pool. To find Winterpoint Townhomes: from Park Avenue take Village Road, then turn right on Primrose Path, and Winterpoint Townhomes will be on the right before 4 O’clock Road. Or, take 4 O’clock Road west from Park Avenue, turn left on Primrose Path and the six buildings on the left are Winterpoint, or just prior to Primrose Path, turn left into the Winterpoint driveway. Do you have any questions about Breckenridge real estate? Talk to the experts! You can call us at (970) 453-2200 or send us a message online.